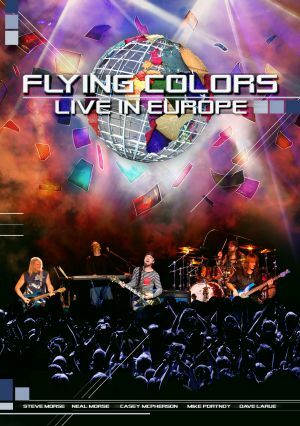 FLYING COLORS [STEVE MORSE, MIKE PORTNOY, NEAL MORSE] - LIVE IN EUROPE (DVD) | Online Shop | Wizard LTD. Album: "LIVE IN EUROPE (DVD)"
Flying Colors launched in 2012 following a formation that began with a simple idea: virtuoso musicians and a pop singer joining together to make new-fashioned music the old fashioned way. Refreshing, classic, old and new, the recordings are saturated with the many styles, tones and hues of the players who in becoming a band delivered a unique fusion of vintage craftsmanship and contemporary music. Flying Colors is Mike Portnoy (drums, vocals), Dave LaRue (bass), Neal Morse (keyboards, vocals), Casey McPherson (vocals, guitars), and Steve Morse (guitars). The release Live In Europe captures the quintet in Tilburg, Holland performing at 013 on September 20, 2012. Directed and Edited by Bernhard Baran (Guns n&apos; Roses, The Cure, Porcupine Tree) with Bill Evans returning as exec producer, the concert presents the entire studio album performed along with popular favorites by individual members. The performance captured in Tilburg includes: "Blue Ocean," "Shoulda Coulda Woulda," "Love Is What I&apos;m Waiting For," "Can&apos;t Find A Way" (Endochine / Casey McPherson), "The Storm," "Odyssey" (Dixie Dregs), "Forever In A Daze," "Hallelujah" (Cohen), "Better Than Walking Away," "Kayla," "Fool In My Heart," "Spur of the Moment" (Dave LaRue), "Repentance" (Dream Theater), "June" (Spock&apos;s Beard), "All Falls Down," "Everything Changes," and "Infinite Fire." The release includes the documentary ‘First Flight’ featuring exclusive interviews with each band member, meet & greet footage and candid moments on the road captured backstage, in the dressing rooms, the band bus, and during tour rehearsals. The 45 minute documentary includes excerpts from songs recorded during the band&apos;s very first show (LA, USA), first show in Europe (Hamburg, Germany) and final show (London, UK) of the tour.